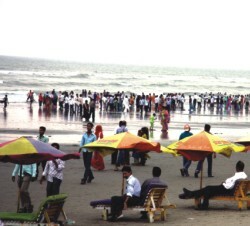 Eid is no longer confined to visiting friends and relatives in the city or home village. For many harried city people especially the urge to just get out and explore the unknown and beautiful, to be closer to nature, is hard to ignore. Over the last few years many people, taking advantage of the long Eid holidays, have opted for a short reprieve to the many tourist destinations within the country. With better transport and accommodation as well as innumerable agencies offering attractive tour packages, a visit to one of these enchanting holiday spots is becoming more and more attractive. This season with Eid-ul-Fitr and Durga Puja occurring one after the other, people will be enjoying a longish holiday and many are planning to spend it travelling to a tourist spot. The Star highlights some of the favourites. If you're looking for an enthralling Eid getaway, look no further than the Northeast of the country. Set within the picturesque Surma valley, Sylhet division offers a charming mix of historical sites, beautiful landscapes, soothing forests and a unique cultural heritage that will leave you yearning for more. Throw in excellent highway connectivity and Sylhet has the potential to be your dream Eid destination. Sylhet city is roughly 230 km from the capital and it is a smooth 4-5 hour drive. First-rate highway restaurants along the way mean you can stop for a breather as often as you like. Train journeys take slightly longer, but can be fun as the line passes through the Lawachara national forest range, and you can still see the marks of the Magurchara gas explosion that ravaged the Shaal trees in 1997. Sylhet International Airport is half an hour's flying time from Dhaka, and most of the private airlines as well as Biman offer several daily flights. Outside the divisional headquarters there are few good places to stay. So unless you have accommodating relatives, it would be a wise plan to set up base at one of the better hotels in Sylhet city. From base camp in Sylhet, most of the top attractions of the northeast are only a couple of hours away. 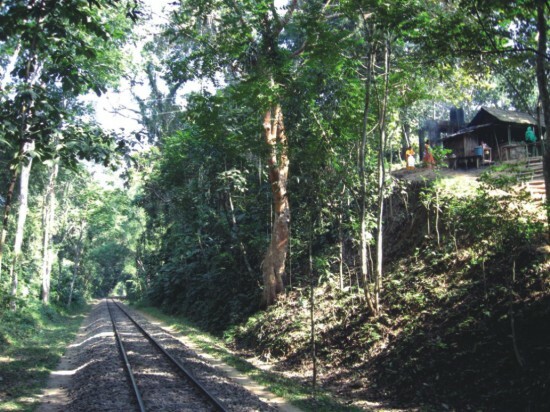 Jafflong, famous for its beauty, boulders and betel nuts, lies sixty kilometres to the northeast of Sylhet. Nestled at the foot of the Khasia-Jainta hills, it is a place of pristine loveliness. 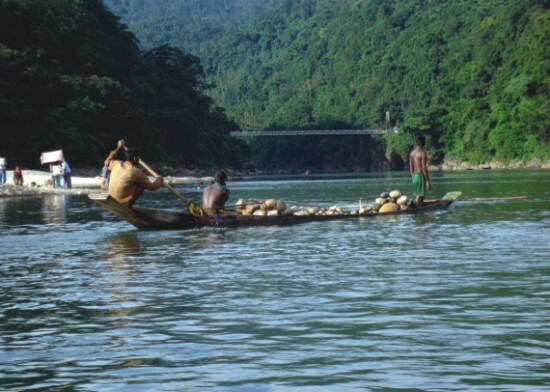 The Piayin river slices through Jafflong and the river is woven tightly into the lives of the local people. A riverboat trip is one of the main attractions. Although the boatmen are used to fleecing tourists, and will charge exorbitant sums, a bit of haggling will get you an engine boat for Tk. 250. The whole family will fit in, and the clear waters of the Piyain will soon be rushing past as the boat heads towards the Zero Point -- the border between India and Bangladesh. The Indian town of Dauki Bazar can be seen on the mountain, and lorries can be spotted roaring up the winding roads. Not even the menacing sight of Indian BSF watch towers in the distance can detract from the scenic beauty of the spot where the river, hills and brilliant blue sky form a glorious triad. 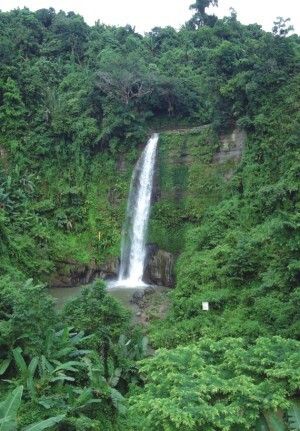 During the rainy season torrents of water can be seen gushing down the mountain forming small waterfalls. The spot where most tourists gather is called Bollar (boulder) Ghat, and the name tells its own story. Boulders have become Jafflong's bane. With stone mining companies using heavy machinery to extract stones from the river and the surrounding areas, Jafflong's natural beauty is under threat. Efforts are underway to preserve the area as an ecopark. Visitors who venture to the far side of the river can see the little Khasia villages or “Punjees”. The Khasia, the indigenous people of the hills, live in total harmony with Jafflong's idyllic beauty. The punjees consist of cute houses on bamboo stilts. The space beneath the houses is used to store firewood. To the casual observer, wild animals may seem to be the reason behind the curiously elevated construction. But the real reason is far less exotic: flash floods during the rainy season. A walk through the Khasia Punjees will take you through large plantations of Paan (betel leaf) and Supari (betel nut). The Khasia once practiced a pagan religion, and old records portray them as a fierce and warlike tribe. But nowadays the Khasia lead a simple and quiet life growing paan-supari and fishing. Many of them have converted to Christianty. The forest walk will take you to the palace of the Khasia king. It's a modest wooden affair but in the grounds you can catch sight of one of Sylhet's vanishing attractions -- an orange grove. At Bollar Ghat there are local cottage industries that cater to tourists. Local artisans carve souvenirs out of stone, and shopkeepers sell everything from mementos to sarees. Despite the large number of people who flock to Jafflong every day there are no good places to stay and no restaurant worth its tablecloth. Visitors are well advised to carry their own food from Sylhet. On the way back from Jafflong, don't forget to stop at Jaintapur. Jaintapur is famous for its megalithic archaeological ruins. 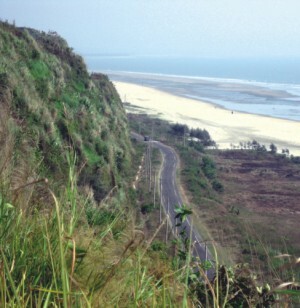 It is located 40 km north of Sylhet town on the Sylhet - Jafflong road. Jaintapur was the capital of an ancient kingdom, which included the Khasia and Jaintia Hills, and the plains of Jainta. The palace of the king of Jainta is an interesting sight for those interested in history. The road back to Sylhet runs past the Tamabil border checkpoint through which mainly coal is imported. A long line of Indian trucks can usually be seen standing by the side of the road. The Haripur Gas Fields also offers a few places of interest. Even if you're not interested in the vagaries of gas extraction, you would be charmed by a spot where natural gas escapes through cracks in the ground. The gas ignites as it escapes, forming a kind of fireworks along the ground. Go there in the evening, and you will see bluish flames darting about on the darkened hillside -- an extraordinary sight. Lawachara National Park, located 60 km south of Sylhet city in the Komalgonj Upazila of Moulvibazar District, offers the perfect antidote for city life. With spectacular views and forest walks, a quiet stay in nearby Srimongol will detox you from the world. Lawachara is a two hour drive from Sylhet. If you're traveling from Dhaka, daily bus services (AC- Tk 400, non-AC TK 200) from Sayedabad Bus Terminal to Srimongal are available every couple of hours and take about 4 hours. If you want to take a car, take highway N2 from Dhaka, and turn right at Mirpur (in Habigonj district) junction towards Srimongol. From Srimongol, the National Park is only a few Kilometres away. The Park itself consists of 1250 Hectares of semi-evergreen forest. Lawachara forest boasts a rich biodiversity of 460 species of plants, birds and animals. There are three forest trails, and you will quickly find yourself deep in an idyllic world where the trials and tribulations of everyday life seem to melt away. There are many exotic plant species, and if you're a bird watcher this is the place to be. Among the larger animals the main species are the macaque monkeys and the hoolock gibbons. They can be seen swinging from tree to tree in the early morning. The animals take cover during the heat of the day, but their haunting calls can be heard echoing through the forest range. Lawachara is also a habitat for wild chicken, squirrel, and python. Local elders speak of leopards roaming the jungle, but those have long been extinct. As more and more tourists visit Lawachara, there is concern regarding environmental degradation. Empty coke bottles and abandoned poly bags in the forest are an ugly reminder of the polluting footprint of man. Do not go there unless you are a nature lover! A short hop from the jungle is the quaint tea town of Srimongol. Here you will find suitable accommodation. The mini bungalows of the Tea Research Institute are available for around Tk 3000 per day, but you may have to book in advance. Srimongol is surrounded by terraced tea estates set among rolling hills. The aroma of raw tea fills the air near the large tea processing plants. If you are interested in the process of blending tea, take a walk around the factories. Sylhet isn't called the “Land of Two Leaves and a Bud” for nothing. Madhabkunda Falls is another must-see tourist attraction in Sylhet. It is no Niagra, but the waterfall set in a lush green setting makes for spectacular viewing. Boasting a height of 200 ft (61 m), Madhabkunda is the largest waterfall in Bangladesh. Madhabkunda is situated in Barlekha Thana of Maulvibazar district, and is a three-hour drive from Sylhet. It is about 350 km from Dhaka city. Geologically, this waterfall is in the Patharia Structure and is composed of the rocks of the Bhuban Formation. There are interesting myths surrounding the area. Madhab is another name for Vishnu and Kunda means circular depression or well. Local Hindus believe the circular pool where the water falls is a magical place, and many worshippers go there every year. Although the water in the pool is not very deep, several tourists have unfortunately lost their lives in Madhabkunda. This happens when people venture too close to the fall and are dragged under by the force of the water. Some enthusiastic visitors climb the hill from where the water rushes down. Several have fallen to their death. Stay clear of the falls, and you will be safe. Lawachara national park-- feast for the senses. Although Madhabkunda eco-park officially exists, modern facilities are not available. There are no good places to stay, and restaurants are very basic. Even the parking arrangements seem haphazard. It is wise to carry a change of clothing with you, because few people can resist the allure of the cool water, especially in the summer. The vegetation around the fall is thick, and a viewing tower erected a few hundred metres away can be an excellent vantage point. Off the beaten track, Sylhet offers some interesting sights and sounds. The haors -- low-lying wetlands teeming with wildlife -- are fascinating places for those who like to get up close and personal with nature. Tanguar Haor in Sunamgonj district is home to hundreds of species of resident and migratory birds. The haors also offer excellent fishing opportunities for the enthusiast. The stone quarries of Bholagonj are also worth a visit. However, these are not picnic spots, so be prepared to rough it. For most tourists, the tomb of Shaikh Jalal ud Din Bin Muhammad (popularly known as Shah Jalal) the 13th century religious teacher and reformer is an essential stop. Shah Jalal arrived in Sylhet from Kunya in Turkey via Yemen. The local King Goura Govinda, reportedly a great sorcerer, attacked Shah Jalal and his companions but was defeated. Shah Jalal's exploits became the stuff of legend. Islam came to Sylhet with Shah Jalal and his shrine stands right in the heart of Sylhet city, testimony to his greatness. A few days in the land of Two Leaves and a Bud are sure to translate into an enchanting holiday. It won't break the bank, but will leave you with memories that will last a lifetime. Kuakata has always remained remote although it is only about 280 kilometres away from the capital. To plan a trip to Kuakata today you need to go through the painful task of finding someone who has been there already. There is no round the corner luxurious buses leaving for Kuakata from the capital. Two buses, rundown and uncomfortable, leave Dhaka everyday for Kuakata from Gabtoli. Then you have to cross six ferries if you are travelling by road. The last 24 kilometres, where you have to cross three ferries over some of the most beautiful rivers on earth, is something of a nightmare. Whatever is left of a road is heavily dotted with pond-like ditches and potholes. If you are talking about fifteen or twenty years back, I would say Kuakata was probably the remotest part of the country with little or no road communication at all. Even if you took an over-night launch to Patuakhali you have the gruelling task again of crossing the last 75 kms of bad road to this pristine seaside. Kuakata and its surrounding places are absolutely beautiful. The km-long beach is vast where nature reigns supreme. You may at any time be alone with yourself and nature with a few steps away from the main beach on either side. Along the beach on the eastern side age-old forests stand tall where Rakhaine young men still hunt for wild boars with traditional traps. 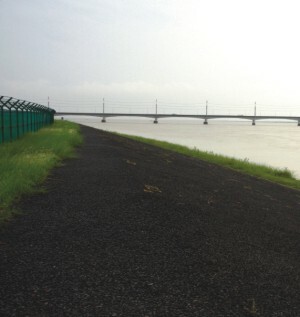 Nearby the river Gangamoti descends onto the Bay with majestic style. From the main beach you may convince a local fisherman to take you on a ride to the nearest mangrove forest called Fatrarchar. You may spend the day there trekking, bird watching and swimming in private without the fear of being devoured by a tiger. 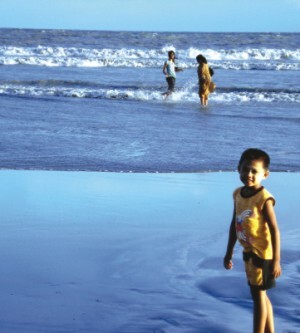 Most people in Kuakata survive on sea resources and lead very marginalised lives. Most importantly, they respect anyone coming to visit their country. The good thing about the Kuakata society is the law and order. Tourists may spend the night strolling the beach or sleeping rough or singing and dancing without being bothered. Most villagers around Kuakata are hard working and hospitable. I would say the best way to go to Kuakata is to book a cabin on a regular launch to Patuakhali. The launch journey is comfortable and picturesque if someone is not so fussy about the toilet. From Patuakhali there are buses leaving for Kuakata every hour or on e may hire a microbus for around Tk 3000. It is only recently that Kuakata witnessed some investments from outside. Half a dozen good hotels have been built where rents may vary from Tk 800 to 3000. Otherwise there are plenty of small hotels. Roadside restaurants are plentiful where over-spicy fish and meat curries attract many tourists. To my experience, although the Parjatan accommodations are crumbling due to lack of maintenance, its restaurant rates the highest among all other restaurants in Kuakata. If you are not a nature lover, I am afraid Kuakata does not offer much apart from Buddhist temples and Rakhaine villages. The government of Sheikh Hasina declared Kuakata an Exclusive Tourist Zone in 1998 and promised to turn it into a model tourist spot for the whole region. Unfortunately, the government's intervention in Kuakata's development ended by the declarations. The government should immediately make a master plan for Kuakata and strictly guide development activities accordingly before it is too late. Of course the authorities should put in place the basic infrastructures like roads and bridges. But the pressing demand is the master plan. For several top real estate developers from Dhaka have embarked on buying thousands of acres of land in Kuakata without any plan whatsoever and it wont be long before mindless concrete jungles overshadow its pristine landscape. After all we are the most densely populated country in the world. Jamuna Resort attracts a lot of corporate clients who, along with visiting the spot with their families, also conduct day-long to week long conferences and seminars, both local and international. For more information, call 8142971. The Sunderbans, the largest mangrove forest in the world, has always been an irresistible attraction for holiday makers. The remarkable diversity of the forest fauna and flora, the dazzling expanse of green, the blue heaven overhead meeting the horizon, the playfulness of high tide and ebb, the very smell of life in the air, the pristine sea beach, the simple lifestyle of the fishermen-- everything has an idyllic touch. The forest itself is teeming with exotic birds, deer and monkeys and once in a while the adventurer may get a glimpse of what this forest is so famous for - the Royal Bengal Tiger or at least find a pug mark or two on the path. A few travel agencies for the last few years have been arranging package tours to the Suderbans including special offers for the Eid holidaymakers. Bengal Tours Limited and The Guide Tours Limited have special Eid trips to the Sunderbans. 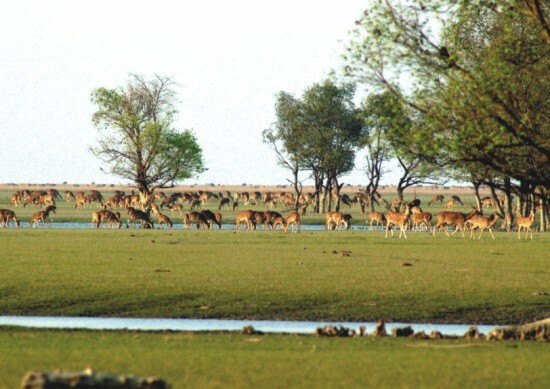 Both trips will start on September 23 from Dhaka and will provide skilled tour operators to guide the tourists through the splendour of the Sundarbans. The destination of both packages is Tiger Point in Kachikhali and Katka, which is one of the three Wildlife Sanctuaries, under the Sundarbans. This point is famous for viewing wildlife as well as for some adventurous trekking in the grasslands and the forest. 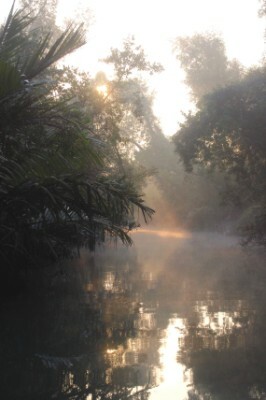 Both agencies provide country boats for tourists to explore the narrow creeks in the jungle. The trips offered by both will arrange boats from Khulna, however, they have different packages to Khulna from Dhaka. Bengal Tours Limited will take holidaymakers from Dhaka by air-conditioned bus service. On the package offered by Bengal Tours Limited, the Executive Director of the agency Musud Hossain informs that the five-day package charges Tk. 9,500 for the locals and Tk.11500 for the foreigners including transportation cost, accommodation and food.
" 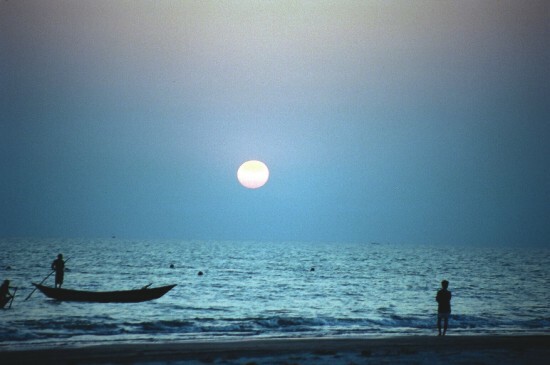 The travellers will also be able to visit an isolated sea beach deep in the Sundarbans. Our boat M. V. Dinghy has the capacity of 46 sleeping accommodation," he adds. On the other hand The Guide Tours Limited have different options to go to Khulna. According to the Guide Tours and the agency will charge per person Tk. 10,000.00 (require a minimum number of 25 persons to run the trip) for the exclusive cruise M.V. Aboshar arranged by the agency. "The travellers will have to pay additional charges to go to Khulna from Dhaka depending on the options they prefer. They can go by either by public AC or use domestic air in regular class Dhaka- Jessore, from where they can go to Khulna. We will arrange everything," informs Himika Shahid, senior manager, The Guide Tours Limited. For those who cannot spare more than a day for excursions there are day-long trips for those who want to spend Eid with family and friends on the largest traditional wooden boat. The serene cruise in the riverine countryside will offer the holidaymakers the traditional culture of the people living near the rivers, watching fishing and others. 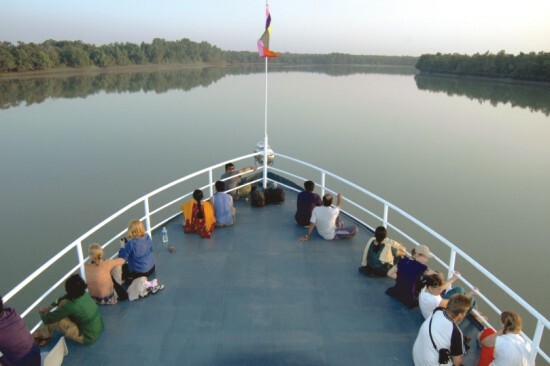 Jeba Tours Limited has arranged a month-long river cruise in the Padma River on its Panshi Nao. The echo-friendly boat is made with all safety equipment and include modern amenities, toilet, kitchen, lobby and resting place facilities, informs Mahruf Rahman Bhuiyan, the director of Jeba Tours Limited. The Panshi Nao will start from Maoa Ghat, about 35 km away from Dhaka. The boat will take the travellers to the Char areas of Padma River in Shariatpur district. "There the toursist might even get a glimpse of the Gangetic Dolphins and watch the catching of Hilsha fish. For their entertainment the local bauls will perform on the boat," Mahruf adds. According to the agency the cost per person for the trip is Tk. 2000 per person for a group of 10 people. Eid special daylong river cruise offered by Jeba Tours Limited continues from September 9 to October 8. And for those who are scared of travelling in the mighty Padma River, but still want to go on a river cruise can take the offer of Contic, which has three packages during the Eid vacations. The agency has two boats The Fleche D'or and B613 and both will travel the rivers surrounding Dhaka city. "We start from Dhaka at 9 am and drive down to Savar, from where the boat plies downstream on the rivers Dhaleshwari and Buriganga. Eid or not, we will probably encounter some river gypsies and if lucky some Gangetic dolphins. After cruising for about 3 hours, the Fleche D'or enters the Old City and merges into the overflowing life of Sadarghat where you can spot the grandeur of the Ahsan Manzil. After a full-day cruise we return at 5pm and for a half-day cruise we head back at 2.30pm," informs Wasama Doja, the Manager (Management and Operations) of Contic. Contic is the perfect place for anyone looking for a boat ride or a river cruise this Eid. It stands out as a tour company because Contic supports our heritage by restoring and using the traditional boats of Bangladesh - a tradition that has been rapidly dying. Contic, which started out in 1997, also brings together the ancient technology of the carpenters of Bengal with ideas from the rest of the world. Contic offers a complete package this Eid. According to Wasama, Contic “takes care of you from the moment we pick up,” till they drop passengers off back home after the trip. "All our prices include transport to and from our shipyard in Savar, where we board the boat to sail down the Dhaleshwari river, as well as a sumptuous Eid lunch and/or dinner. For a these day trips, we have a minimum of eight passengers and a maximum of 30 passengers. The price for this cruise will be BDT 3000 per person for the full day cruise and BDT 2700 for the half-day cruise," he adds. 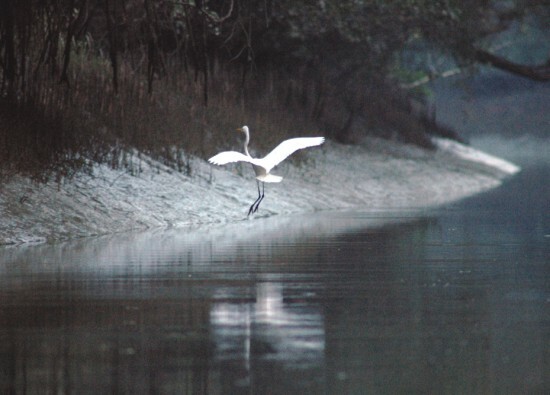 The magic of the Sundarbans remains unparalleled. Moreover, Contic on Eid will arrange river cruises by its B613. These includes dinner cruise, afternoon cruise, and lunch and dinner cruise, which costs Tk. 3500, Tk. 3850 and Tk. 4900 per person respectively. The Guide Tours Ltd (Phone: +88029862205, +88029886983) has two special packages for those who want to spend the holiday season in Cox's Bazaar. Starting from Tk 2,500 it offers A/C bus tickets from Dhaka to the longest beach in the world, two nights accommodation in an air-conditioned hotel with complementary breakfast, transfers and sightseeing. The trip starts on the 23rd; the following day there is a guided tour to the Broken Hills and Inani beach. The tourists will visit the Buddhist monastery at Khayang Para in Ramu. Another package offers a 3three days/ four nights stay on the St Martin Island, known as the Coconut Island of the Bay of Bengal. Starting at Tk 1,500, the package includes free air-conditioned bus tickets from Dhaka to Teknaf and non-a/c accommodation on twin sharing basis at a hotel on the island for two nights. Both the packages do not include meal of any kind. Parjatan: Unfortunately, Parjatan does not have any special Eid packages this year. “We were forbidden to give out Eid packages during the caretaker rule,” says Parvez Ahmed Chowdhury, Manaager, Public Relations, Parjatan. “But now we are thinking of starting the packages once again next year.” Despite this, however, plenty of people have already booked trips and regular packages through Parjatan. “Most people this year are looking for a vacation in Cox's Bazaar, Khagrachori, Rangamati, Sylhet, Rajshahi amongst many,” he says. “Visitors who book through Parjatan can also find secure Parjatan hotels in the respective destination. For instance, in Cox's Bazaar, we own some of the most popular hotels in the area-- Shoibal, Probal and Upal.” To book with Parjatan, interested individuals will have to get in touch with the several Parjatan outlets that they have all over the country. In Dhaka, Parjatan's head office is located in Hotal Abakash in Mohakhali. It is the best point to watch the sun set in the sea. The tourist spot has a point named sea viewpoint, which is about 500 feet high from the sea level. It is a little tiring task to reach the top of the It gives an amazing bird's eye view of Cox'z Bazar town. The other attractions of the tourist spot are natural caves, springs and some resting places. The entrance of the natural cave gives a thrilling experience of entering the primitive cave. In fact, it is nothing but a dead spring. And in the resting places called 'Honeymoon point', couples can spend intimate moments in the midst of natural flora and fauna. Just hire a three-wheeler or a rickshaw from anywhere in Cox's Bazar to reach the destination it will cost less than taka 100. But be sure to return in the town before night considering the security issue. 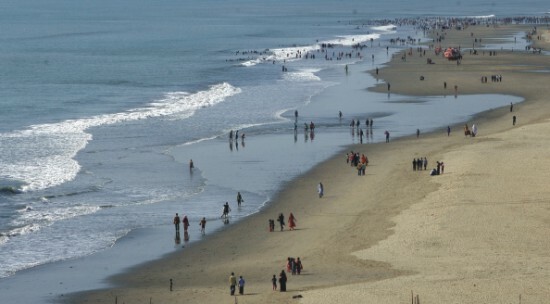 It would be convenient if a microbus, taxi cab of a three-wheeler for the whole day to travel different spots like Inani Beach and other spots in Cox's Bazar in a row.